An average yet fun Rom-com. I had fun with this show's story and characters, even if they aren't great. My main problem is that the girls don't act like regular people would (especially main girl Shiraishi). It still held my interest though and I'm glad I watched it. Would I revisit this show again? Probably not. By the way, the English dub is quite good. It changed my life! Don't @ me. It takes you in by the two first characters smashing in the first two hours of the anime. 10/10 IGN would watch again. 69966996969696969669966969696969966696969696969696969696969696969696996969696966696969699696966969696969969696. This series was really unexpected and a lot of fun. At first it just seem like a comedy with a lot of kissing but it got serious (but still fun) fast. Yamada could have had a regular "delinquent trying to turn over a new leaf" vibe this entire series but instead it was how his interactions with others changed their minds too as well as himself. The occasional boys kissing was really great ///~/// and a welcome change from just kissing all the girls. Though their acceptance of the arrangement was interesting in itself. Overall the series was an unconventional love story and friendship story with all sorts of characters in life anime that is refreshing to watch. I recommend it for sure. This show never failed to make me laugh and kept me hooked the whole time. The ending was beautiful as well, my heart was beating like crazy during the last few episodes. If you are interested in Romance and Slice of Life Anime then Make sure to check this anime out. It has a good pace and a storyline that will leave you wanting for more episodes. it aired a few years ago (in 2015) and I wished I watched it earlier, Overall it was an amazing anime, one that I will for sure be rewatching in the future. Lastly, If you want to know how the story goes on make sure to read the manga after watching this anime, you sure as hell won't regret it., there are about 28 Volumes and 246 Chapters. If you have made it this far, and you are still looking for an anime to watch, look no further and start watching it right now! P.S. I hope season two comes out, if you are reading this (in the future) and there is a season two, your damn lucky, enjoy watching it... I know I will. Mixing comedic elements with some expected harem anime tropes, Yamada-kun and the Seven Witches brings an interesting flare to the dramatic in this magical high-school setting. 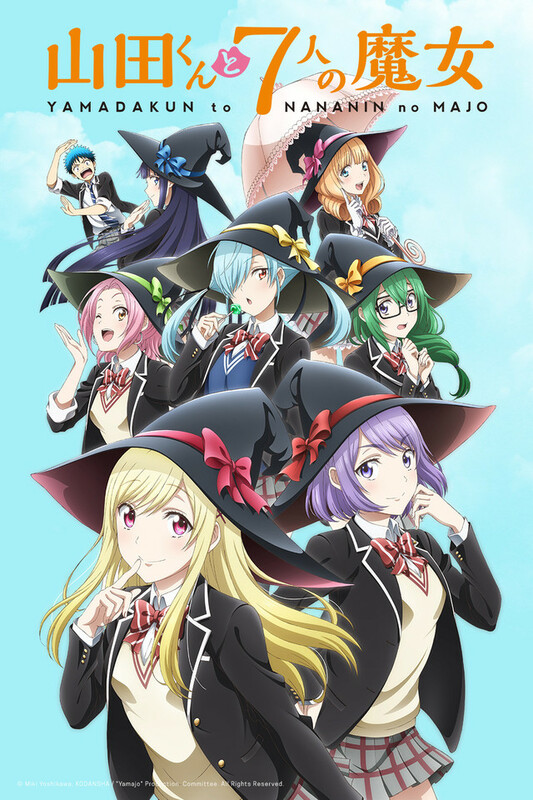 While occasionally dogged by some pacing issues in a few episodes, Yamada-kun can still hold your interest long enough to find all 7 witches and discover the mysteries hidden at this unusual academy. Very cute, very well done. That's what makes this a great show, perhaps even a classic. Yes, there's a *bit* of fanservice, but its not lewd, and its pretty much all above board (there's the obligatory bath scene, swapped genders, and nosebleeds, but nothing that goes out of its way to emphasize things). Also, every girl does *not* fall for him, which is rather refreshing from this sort of anime (it would have been really easy to do that). The story flows well too - and the mechanic is just engaging enough to be interesting, without it turning into an elaborate game. All in all, a very well told story! I loved this anime as I have finished the manga a few months back. I love the concepts and the story introduced in the anime. The ending was good enough to make the series end on a good note, but I wish there was another season to hit it off to finish the manga. It is a wonderful piece of art and romance, it has the perfect blend of comedy too. It made me want to cry by the end it was just that touching, so touching it reached my heart. I really hope Yamada kun and Shiraishi live happily ever after. I'll admit honestly that at first I wasn't sure of this anime. The first few episodes were written poorly... but I am completely overjoyed I kept watching. I'm crying as I write from how truely well developed this anime is, with a masterfully tailored story and characters you can't help but come to love. Please, for the love of God, WATCH THIS ANIME!! !